This little guy just arrived in a random lot from fleabay.My first Tiger 7,what a funky character. TattooDougHardy, boon velvet, Shiverbones and 1 other person like this. @Mr. Humphreys Hi Grace, I imagine you were also following this auction and if not, I'll leave you a couple of photos of this figure that you like. 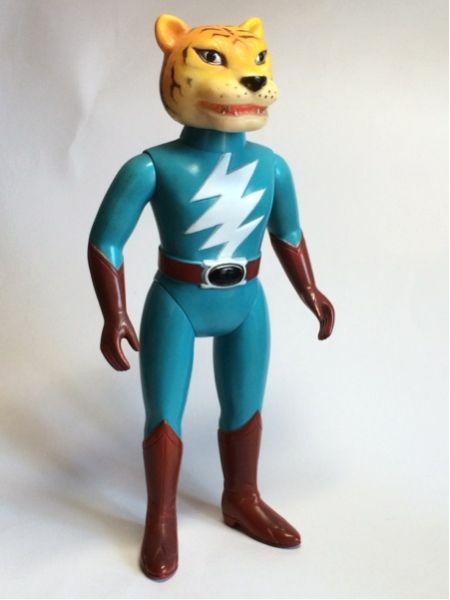 I think the price did not finish very high and I was even tempted to take it, but I thought the nose was very scraped and in some parts of the vinyl had many dirty pores, @ultrakaiju I know that maybe I'm over exaggerating or I'm being very strict with the conditions of the figure but not ended so cheap to pass up those details. Well I hope you enjoy the photos! Also consider the possibility of painting the nose, but I feel that it would be altering in some way the figure. I think that giving a touch of paint to the nose would be something valid, but I do not know why I would not feel quite right. Nooo. No need to paint. The wabi sabi is pure perfection. p.s. 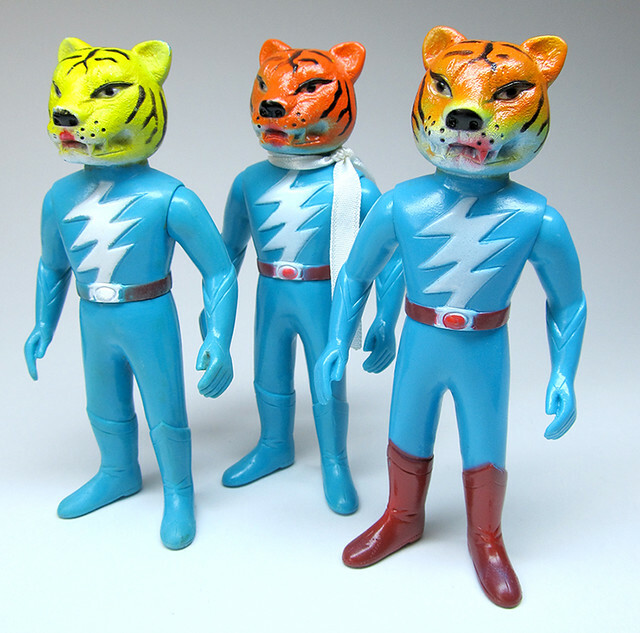 the tigers versions here are orange head, yellow head, orange head. Still wondering why the yellow heads rarely pop up! deafmetal, Alebrije and boon velvet like this. Great tigers Grace! I thought this might be of interest.. an old photo of my mini T7's comparing the colour variations..
deafmetal, doomboy, Alebrije and 1 other person like this. of the 12',’ sans the deadly gloves, look complete. well, although the differences are subtle much more subtle." According the article. Bullmark intentionally produced both an orange and yellow head version for standard and small sizes. For the 5-inch smaller guys, the orange and yellow seems to vary in color saturation, but two head colors are distinctly described. It's nice to see a wave of Tiger 7's hit the market lately. I'm sure more than a few of you were watching the GLOVED Tiger that ended this morning at 99000 JPY. Not too bad a price, considering he has both gloves, and is in decent shape with no graffiti. There were two beautfiul gloved tigers (no rubs or marks) that ended above 100000 JPY, last year. No, I did NOT adopt this tiger , as I am "trying" to hold to my limit of seven . Alebrije and deafmetal like this. I dunno Gracie, that seems a bit high to me. Sure, ones have been commanding a high price in the past, but I wouldn't say he is perfect enough to approach the 100k mark. He does have some wear and paint rubs on him, and discolouration to at least one of the feet. Don't get me wrong, he is actually in incredible shape, and such a lovely feline, but for me [at least] spending that much money (as if I could!) would have to mean he would be near pristine; and I don't think this example fits that. And I do think the aforementioned eye 'flaw' is some kind of defect in paint or vinyl, that is not due to the flash, but I could be wrong. I wish I could have bid on that one that Roger posted. A really nice deal I think, and just the kind and look I'd love to have, even if he was a little loved and missing the gloves. I think that was a very good auction in contrast, but alas! one more time. Haha, Grace, I think you could handle Tiger7 variations from within your collection alone! (A fact to which many of us remain ever so jealous). Thanks for sharing the comparison pic of the 5" Tigers, Scott. I definitely think the paint variation was intentional, if not directly planned from the outset. 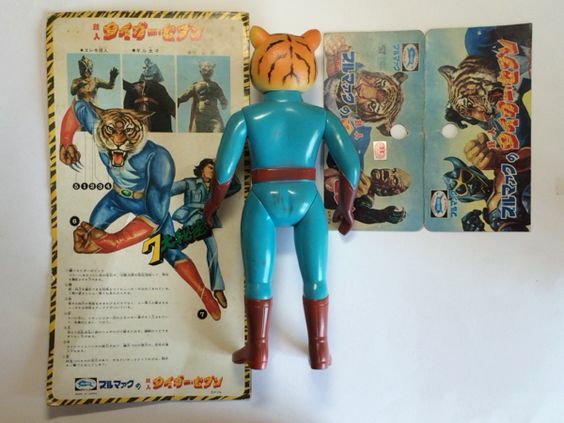 You can also use as an analogue the similar range in yellow/orange Tiger Masks from Nakajima. I believe the really deep orange is the most unusual of the three. Each is wonderful though, and I really like how your versions Scott are so extreme in their contrast, really capturing the range of colour. The previous gloved Tigers were in better shape and lower in price, so you have a great memory Stevie! In fact, that last auction mentioned above, climbs nearly to the price level of a "gloved and bagged" tiger! Grace, I am swooning over your graph and cataloguing skills; I just can't help myself. Toy OCD thoroughness after my own heart. I think it is best that this pattern only goes back to 2013, as the climb before that would probably be too painful to revisit in hindsight. It is also somewhat reassuring to see on two levels: (1) the pattern is more or less consistent I think, and (2) there are other tigers out there at somewhat normal periods, so I need not lose complete heart on my chase. Interesting that you only have the one 'yellow' head collected in this history so far. Not that the sample size is huge, but I hadn't expected that degree of discrepancy necessarily. I sort of think this last one was yellow as well, or at least more yellow; though the photos could be blanching a lot of colour too. Also worth noting, that one-armed fellow still has me scratching the ol' noggin. @Lixx - I have an aucfan account and will pull the prices for you. I should have some free time later tonight. @Lixx - Updated my post with prices. Thanks man- data point central here I come! Hey if you're feeling adventurous do you have exact prices for Graces auctions? I can sort of guess by looking at the graph but can't be exact. EDIT: Wait some of them are here in the back pages. Just need 3/2/14, 3/4/14, 3/22/14, and 4/12/14. Interesting. So I filled in some guesses for those 4 auctions above based on graph position and took out the one armed auction that ended at 10200 (outlier) and came up with a median price of 59701 yen over the last 4 years. Not bad. I thought it would be higher. Now I have hope. And I'm an idiot for not bidding on that 27500 auction. I've been busy traveling so I have not been chained to the computer. Hi Chris! Sorry I left out the data (it was late last night! ). I posted it below the graph! So basically (condition dependant) over the last 4 years you're going to spend around 60000 yen, add 7000 more for gloves, and if you want the full package of a header card and plastic bag (lol! )- but the condition will be a lot nicer tack on another 62000 yen to your 60000 base price. These are just averages- so lets hope more like the 27500 show up! Still lower than I thought which is nice. And gloves don't seem to raise the price significantly (just the damn header card and bag lol). All this is really helpful I guess if you are bidding to know where they usually end up (and did you overpay or get a steal). deafmetal and Mr. Humphreys like this. the large version has such a great eye sculpt,so much character. ^^^Yes, they are one of my favs! ^^^Roger, thanks for the "new" Tiger 7 pics and info. I'll add that to my graphing table!